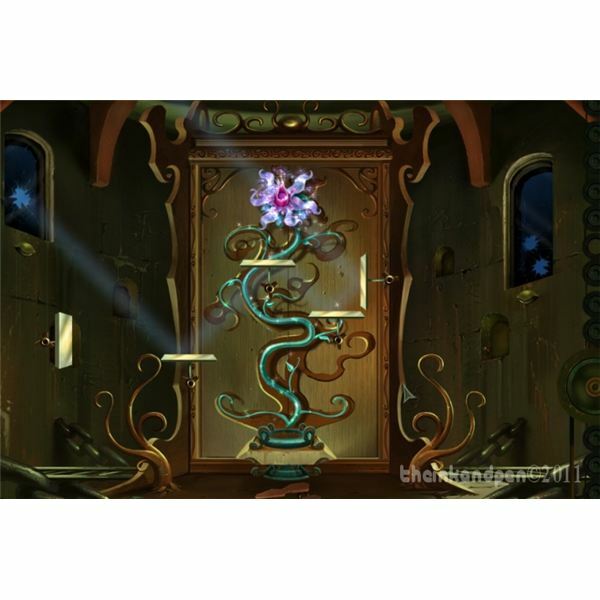 Drawn: The Painted Tower - The Walkthrough You Are Looking For! 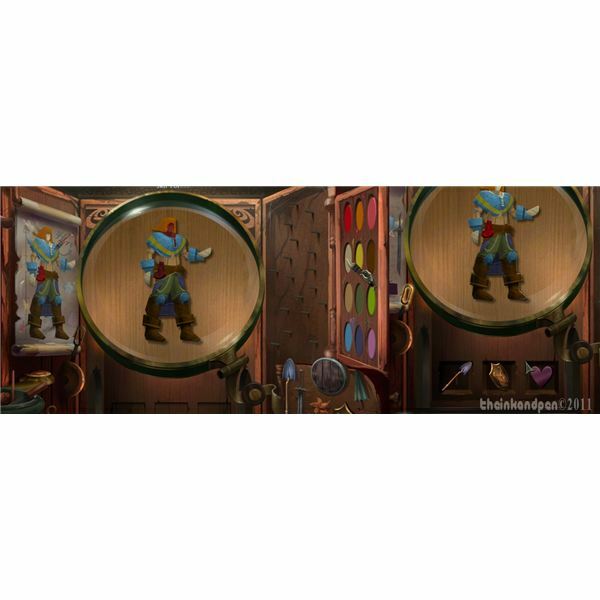 Drawn: The Painted Tower – The Walkthrough You Are Looking For! Welcome to Brighthub's "Drawn: The painted tower" walkthrough. Let's get started straight away by entering the tower. Click on the note on the door. You’ll find the King’s daughter, Iris, is missing and she has drawn you a way into the tower. 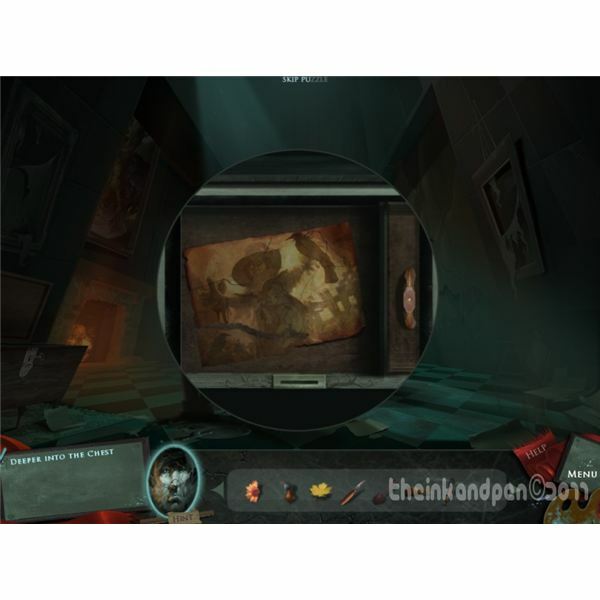 The game is entirely based on puzzles involving paintings at each stage. Click on the ribbon. Pick up the sketch of a handle on the floor, then drag-drop it onto the door and go inside. Click on Franklin the stone guardian. Pick up the part of a chest in the middle of the floor. Click on the chest in the middle of the scene and place the part in it. Turn the two parts until they look like the image. Slide the compartments and pick up the canvas fragment and the key and exit. Use the key on the other chest and pick up the rabbit and pumpkins drawing. Click on the pile on the right side of the screen, and pick up the glowing-eye and picture of a squirrel. Next click on the picture hanging in front of you. Drag-drop the canvas fragment and you’ll enter the drawing of a farm. Click on the scarecrow, who is missing most of his apparel. Pick up the half-sunflower slightly on the right of the field of sunflowers. Pick up the blue thistle near the crow guarding the glove. Pick up the yellow leaf floating in the middle of the scene. Pick up the pole at the bottom of the scene. Put the squirrel-drawing on the stump and pick up the glove. Put it on the scarecrow who’ll give you some shears. Use the shears on the hedge on the far right-side of the scene. Pick up the hat put it on the scarecrow who’ll give you a knife. 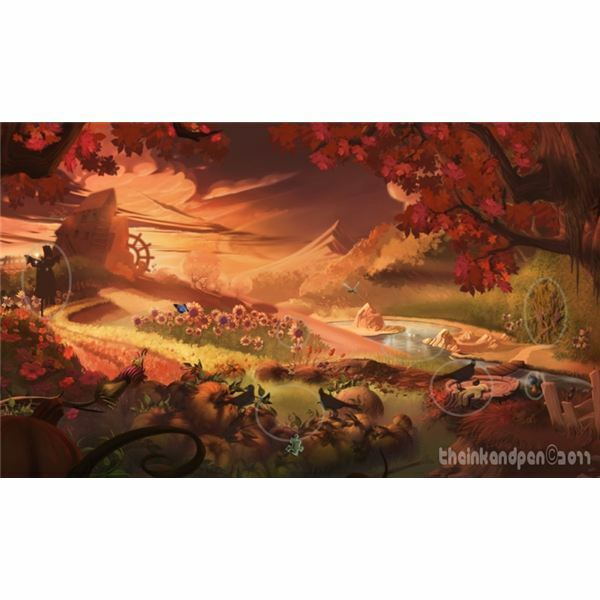 Use the rabbit and pumpkins drawing on the two crows in the middle of the scene. Click on the burrow, use the shears on the vines and the knife on the pumpkin, then pick up the two seeds in the jack-o’-lantern’s mouth. Put the two seed-eyes on the crow who’ll give you the other shovel piece. Combine the two shovel pieces and you’ll get a proper shovel. Use the shovel in the mound of earth near the river, pick up the belt and put it on the scarecrow. Use the line with the pole and fish out the last part of the scarecrow, the boot, who’ll give you the other glowing eye. Exit the painting and pick up the four scraps of paper. If you are having problems watch the whole sequence here. 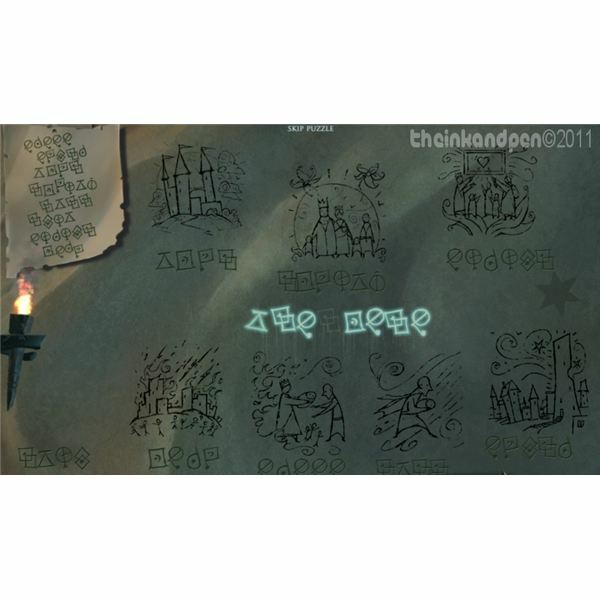 Back to the chest in the middle of the foyer, place the scraps of paper to form a picture then solve the easy puzzle. Take the cold-iron sun. Exit to Foyer, go to the fireplace on the left of the scene, put the glowing eyes in the sockets, put the cold-iron sun inside. Pick up the tongs on the left and use them on the sun. Go to the door on the left, put the radiant sun in the door and go upstairs. Pick up the hammer, click on the painting. Try and enter the painting and it will explode: you now have to restore it. Use the hammer on the broken wall and pick up the shard. Now pick up the ear and mouth on the masks. Exit to the main room. Pick up the dry rag on the first stair-step. Use the rag on the water on the floor. Pick up the sketch of the witch doctor stuck to the column. Go upstairs and pick up four window shards, pick up the candle on the right hand side and click on the dangling star. Go upstairs and pick up the last shard in Iris’s hands. 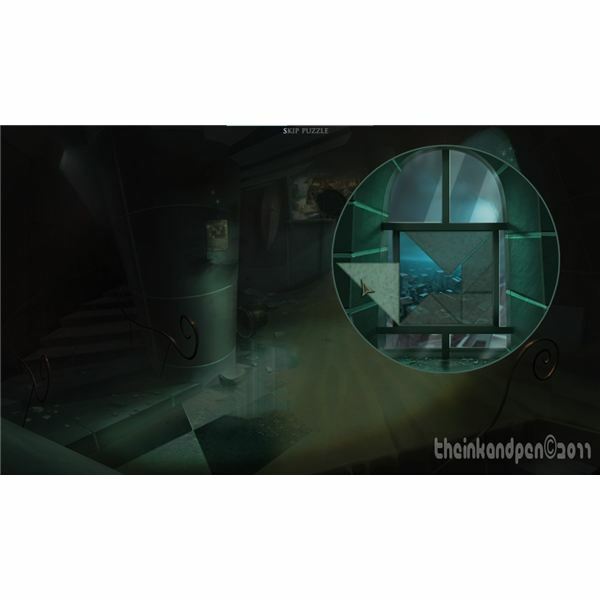 Go back to the original room with the painting and click on the window. You’ll need to place the shards; they turn dark once they are in place. Click on them to rotate them, hold the button to place them. Dig twice with the shovel on the spot by the arrow. Pick up the canvas fragment and fix the painting. Use the wet rag on the painting and enter the painting. 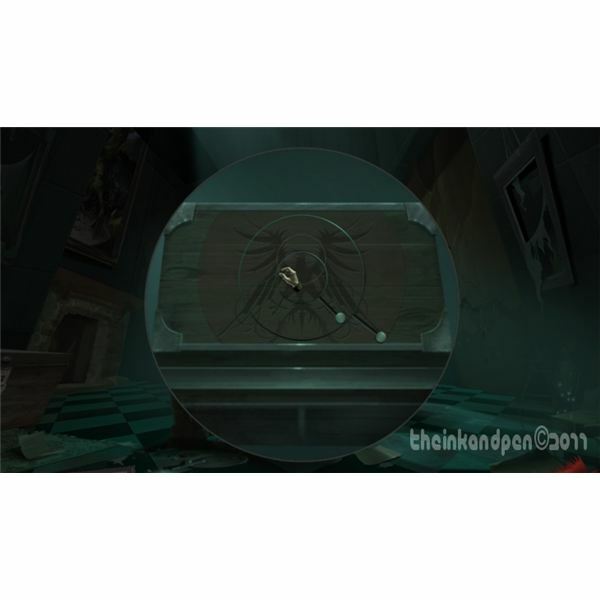 Use the witch-doctor sketch on the painting, drop it near the cauldron. Light the cauldron with the candle, pull the yellow rope at the top three times. Pick up the wand. Break all the pots with the hammer and pick up everything. 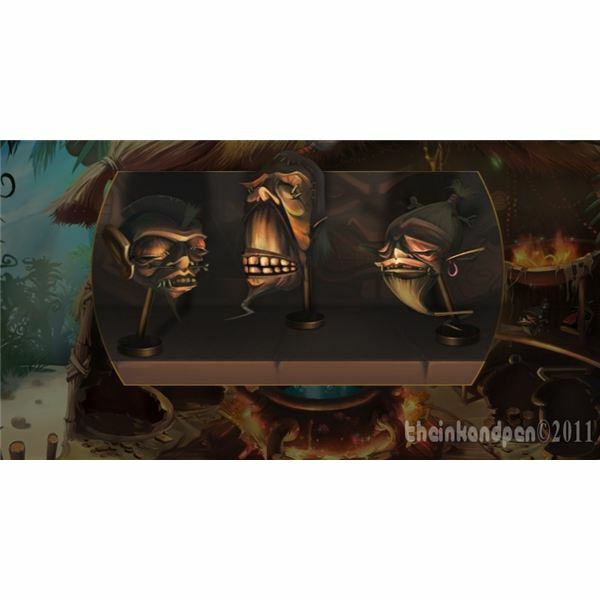 Speak with the shrunken head on the right side of the scene. You have the heads from one the pots. Place them on the stands. Use the ear and mouth on each of them; they will give you feathers and beads for the wand. Speak to the Shaman and place the wand items into each circle. Assemble the partial-net and the net in your inventory, which you took from the clay pots. Go back to the farm-painting. Once inside the farm-painting, use the net to pick up a butterfly, a dragonfly and a bee. You should already have leaf and thistle. Go back to the doctor and click on the sparkling pitcher on the left shelf. It will open the alchemy window. Drag-drop the leaf and use the knife on it, then pick it up. Drag-drop the thistle and click on the mortar to crush it. Drag-drop the sunflower and pick all the leaves. Click on the blue powder, then the small vial on the lower shelf, then the leaves and last the sunflower leaves. Drop the potion in the cauldron. Drop bee, dragonfly and butterfly there too. Take the heart, go upstairs, give Iris a heart and take the thread and needle. Try and head towards the door and the bridge will collapse. Head back all the way down to the foyer. 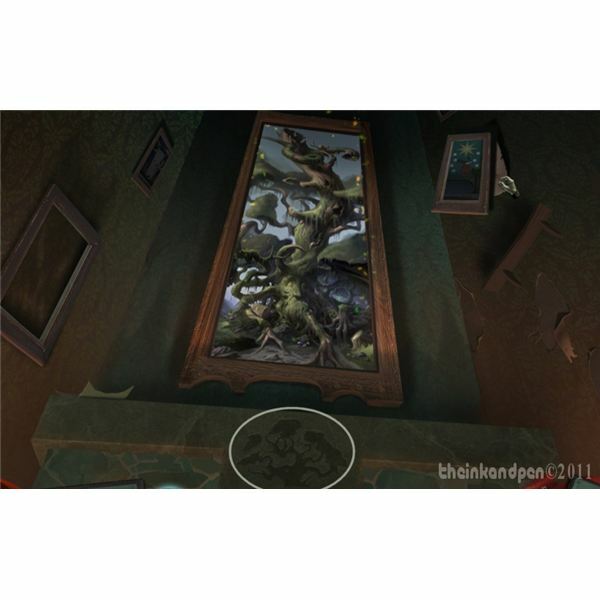 Click on the tree picture in the upper left corner of the Foyer. Stitch it with the needle and thread and enter the painting. Pick up the teddy on the right of the scene. Click on the dark-hole in the tree. Drop the candle inside. 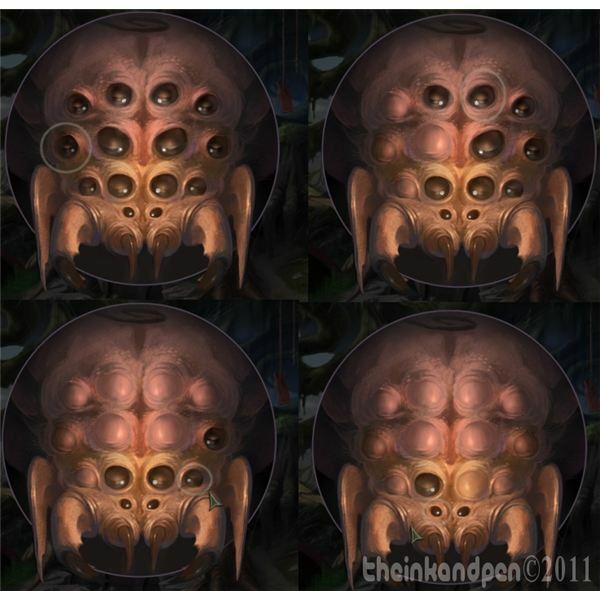 Click on the spider, and solve the eye-puzzle (look at the image). Pick up the Empty can and the hourglass. Continue to page two for the second chapter of our "Drawn: The painted tower" walkthrough. Go back to the Shaman upstairs and fill the can with the potion. Then empty the can on the crevice by the tree. Exit the painting, without going to the foyer, and pick up the sketch of the cardinal, it is on the top right-side of the screen. Re-enter the painting, go up and drop the sketch where the insects are. Keep clicking on the bird until all the insects have gone. Click inside the tree house, pick up the cage and shift every object until you can move the rug. Underneath the rug is a puzzle, which is solvable and not that tough. Refer to this video created by myself if you are stuck. Pick up the chalk. 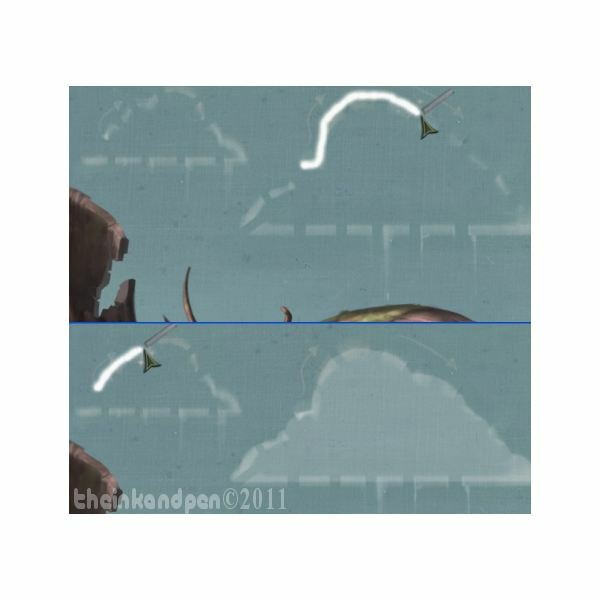 Go back to the top of the tree and draw some clouds, in the right direction indicated by arrows, so it rains. Look inside the tree and pick up the wooden tree carving. Exit the painting and place it into the slot underneath it to end the chapter. Go all the way upstairs, pick up the phoenix egg and go back down. Put the egg in the fireplace at the left of the foyer. Use the birdcage on the firebird. Head upstairs again, through the door to the theatre; drop the birdcage to light the scene. Pick up everything from the table and click on the board on the floor. Draw a sun in the direction the arrow points. You’re in the tower. Drop the picture of the clock-hand on the clock and move the hands to 7:30. Go inside the door on the right; speak to the clock-keeper. Go outside and click on the gear on the stall the left-merchant has. Give him the teddy bear and pick up the gear. Click on the oil can. Give him the letter and pick up the can. You can watch this video for help with the paint sequence coming up. Don't worry about it yet. Go back inside, use the gear on the clock then grease it up with oil. Speak to the clock keeper and head outside again. 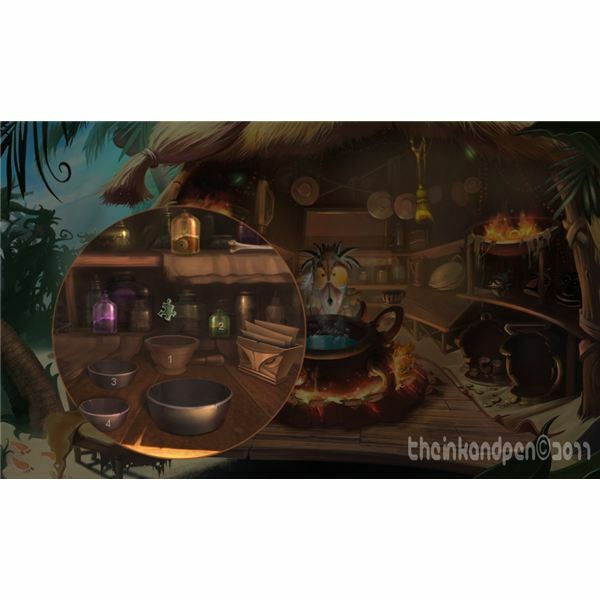 Speak to the merchant on the right and complete the puzzle. Again, if you need help on solving it you can watch the video link given above, which runs through this particular sequence. Use the left door to go up. 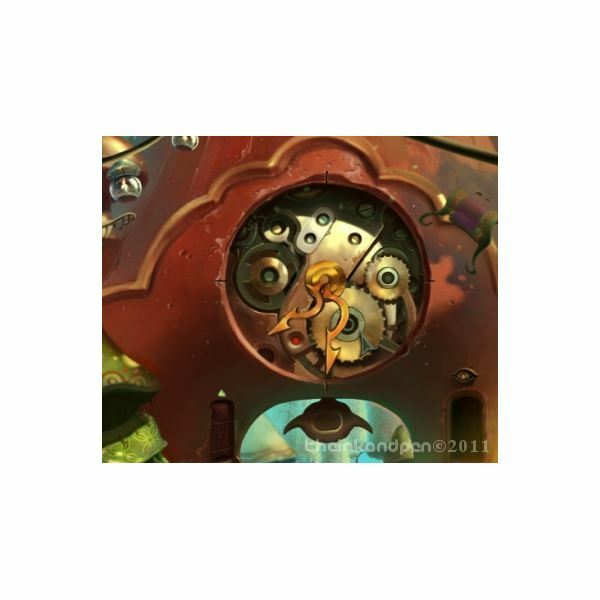 Use the paints on the unfinished scene and use the picture of a bell on the tower. Go back down and speak to the right-merchant. Go to the clock-keeper and speak to him. Give the costume to the right-merchant outside. Give him the hourglass then head back to the theatre. Click on the board on the floor and draw a moon. Head back to the tower. Head up with the left-side door. Use the hourglass on the constellation and, when the shooting star is inside, pick it up. You need to draw the sun again, in the theatre area, and speak to the left merchant. He will give you a seed. Go inside to the door on the right and head up the tower. Click on the two eyes near the windows and put the seed in the pot. Move the mirrors so the seed grows. Watch the sequence in this video. Next head to the theatre again and make it dark, draw a moon. 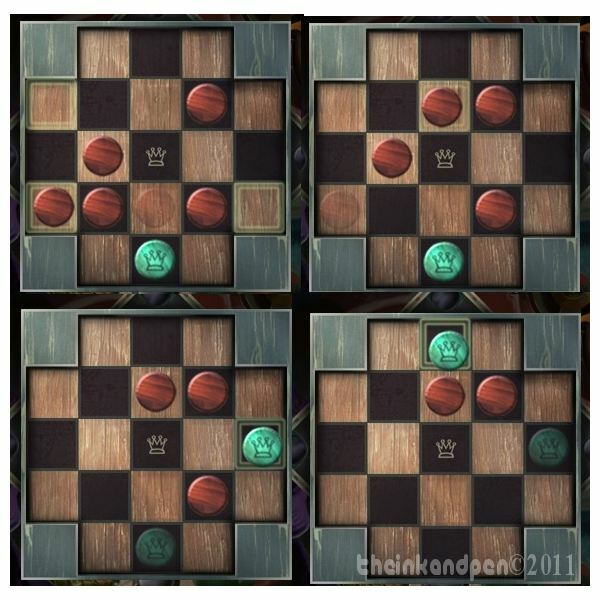 Play the game of checkers with the left merchant, look at the image for help. Take the slingshot and head where you planted the seed. Break the windows with the slingshot. Play with the mirrors, or look at the image, so the flower can blossom. Take the wood-pieces from the right and assemble the knight. Like the window in Chapter 2, the pieces will turn dark once in the right place. Use the chisel, in the tool bin on the left of the scene, on the wooden form. Give it a coat of varnish with the red brush. Next use the guide for how to colour it in, with the brush and colours on the left. Pick up the shovel and use it into the first window underneath the figurine. Put the heavy shield into the second and the heart in the third. Click on the lever to run the sequence. Short chapter. Click at the top of the screen, it will tell you a catwalk has been exposed and you can now head up. Go through the door, examine the wizard’s hat and pick up the chisel. Examine the lectern and pick up the sheet and the key. You can move the eagle-sketch to read the rest of the play. Pick up the red rock in the right bottom-corner of the torn painting. Head upstairs. There is a numerical puzzle, which might be tough for some; all the adjacent numbers add to the total in the middle. It is not too difficult but do look at the image if you find yourself stuck. Head through the hole. Continue to page 3 of our walkthrough for "Drawn: The Painted Tower," which will see you through the Hall of Giants and Fire and Ice chapters. Click on the door ahead of you. Use the chisel on the glowing rock. Click on the sparkling rabbit’s head; note the colours used for the eye. 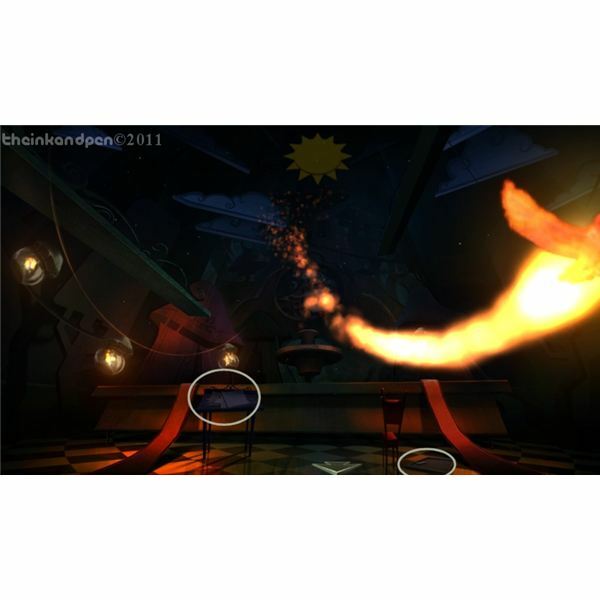 Pick up the lit torch and use it on the torch-holder on the far left-side of the screen. Pick up the tile which is now visible above the lit torch. Click on the newly appeared painting. Insert the missing tile and solve the puzzle by rotating each piece; the lines should run smoothly. In the cave pick up the blue rock afoot the brightly-lit tree. Click on the axe in the tree-hole on the right side of the scene: the owl will move. Use the axe on the tree and pick up the stone-owl. 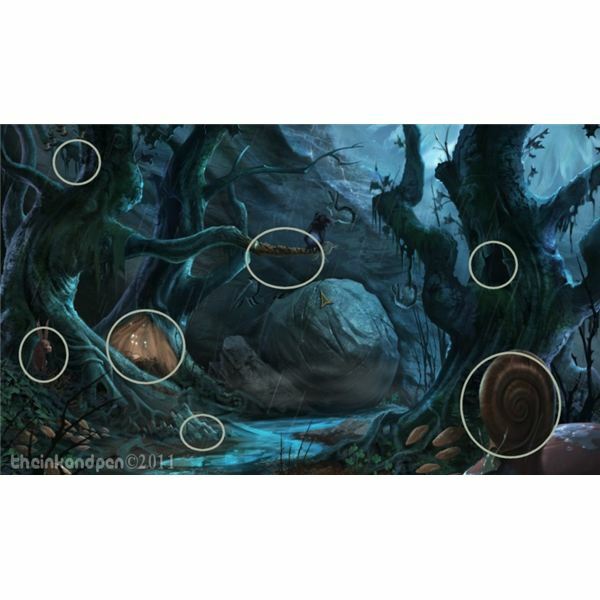 Use the axe on the snail-shell in the foreground on the right and pick up the stone-snail. Pick up the apple on the atop the tree on the left side. Click on the rabbit. Enter the lit tree. palette. You need to create: green (yellow+blue), purple (red+blue), yellow (yellow rock), orange (yellow+red), blue (blue rock) and red to fill the palette. Grab the palette and exit. Return to the rabbit’s head outside. Paint the other eye to match. Pick up the sketch of a carrot and return to the previous nightly-forest scene. Give it to the rabbit. Pick up the stone rabbit. Insert all three stone figures in the slots: a cave will open up. Before entering, exit the painting and grab the stone weight. Exit to the main screen and grab that torch you placed in the holder. 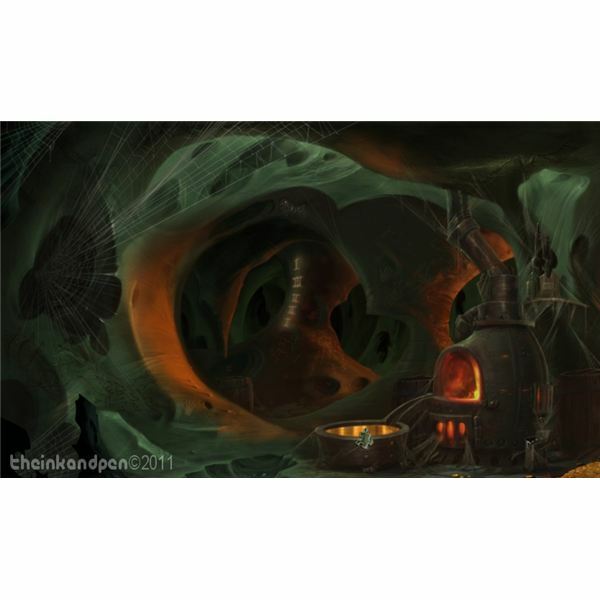 Go back into the painting and enter the cave. Place the torch in the holder on the left side of the scene. Place the sheet of symbols on top of the papers. Match the runes in the sheet with the ones on the wall, by length; i.e. if one is 4 runes long, find one on the wall of the same length. The story that appears should make sense. If a letter doesn’t light up in the middle, you have the wrong one. Look at the image if you are stuck. Pick up the star on the wall after the cut sequence. Grab the torch and go to the scene where you first started – with the huge pillar, the rabbit etc… – and enter the unblocked door. Put the weight on the left rope. Play with both ropes until an image of Iris appears. Put the star in the slot. Enter the area on the left. Pick up the Gnome on the far right, and the goblet. Enter the painting. Place the torch in a holder on the top left-side of the screen. Pick up the pick-axe on the bottom left and the mallet next to the missing gong. Head to the left of the scene. Pick up the bellows. Use them on the furnace. Click on the bright roman numerals, speak to the dead adventurer, use the pick-axe on the crack and pick up the gold ore. Put the gold ore in the cauldron near the furnace. Dip the goblet, the gnome and the apple and return to the dragon. Place all three objects on the scales you see next to the creature; it’ll get mad and you’ll exit. Look on the empty pedestal and pick up the torn canvas. Place it on the painting to the right and enter. 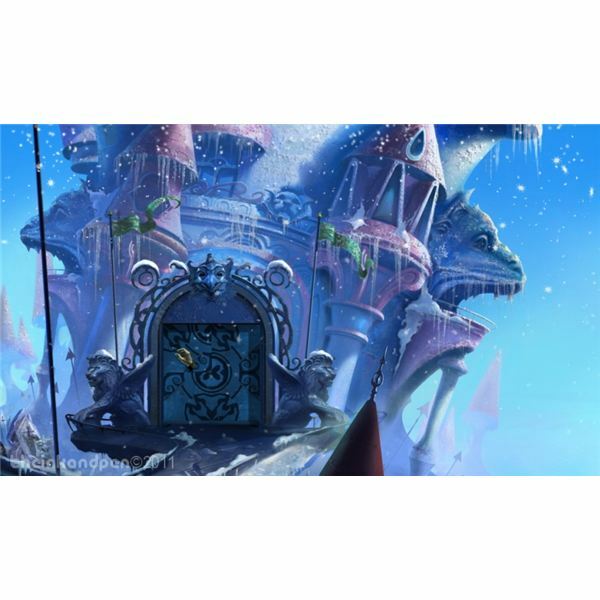 Pick up the frozen statue-piece on the floor and the other to the left. Rotate the four tiles on the door so they make a pattern with a circle in the middle (look at the image). 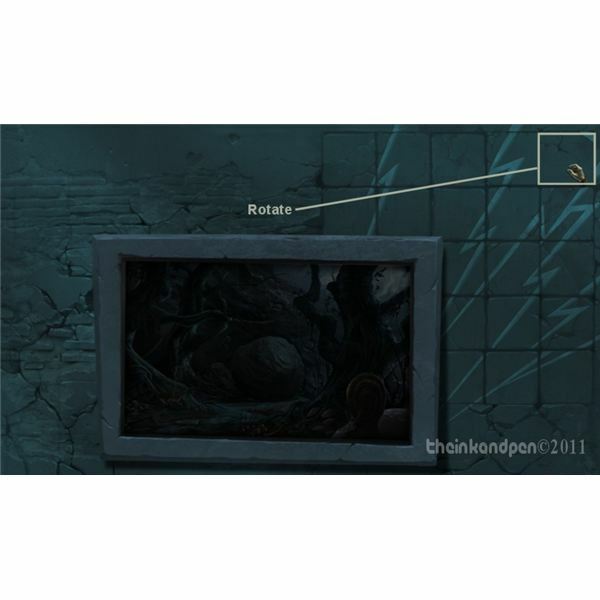 Exit the painting and click on the gargoyle to the left. Play with the whiskers until all teeth are closed, or look at this video if you need help. Enter the painting again and the door will open. 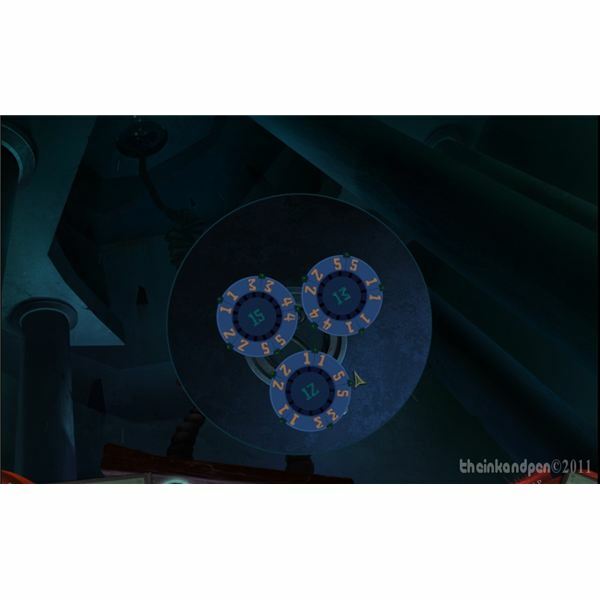 Inside the frozen cave, pick up the remaining pieces of statue on the floor, and pick up a red gem near the top. Assemble the statue; pieces only go a certain way so try again, its not difficult. A puzzle will appear, where you need to click on the eyes on the top in order to match both green arrows. Try to work it out or watch the video. Pick up the shield on the floor and return to the dragon painting. Put the shield in the melted gold and note the sequence of numerals on the cave; I, III, II, II, I. Hang the shield as a third gong in the dragon-scene. Play the gongs in the same sequence as the numbers. Pick up the key and open the chest for a puzzle. Watch the video if you are stuck. Pick up the gear and the two gems. Exit the scene and place the gear in the middle pedestal. Go to the griffon again. Place the gems in each elephant eye and play the musical game. Try and remember the patterns and play them exactly as they appear. Pick up the final gear from the chest, then go back to the pedestal in the main room and place it. Enter the area and click on the big book. Place the griffon key in it. Flip the pages and you’ll see all the previous characters in the paintings you’ve visited. Go back to all of the paintings of the painted tower – farm, tree, witch-doctor, dragon and Griffon – and pick up all the sketches. Go back to the book and put them in it, in order. Close the book after the sequence, pick it up and head for the door. Give the book to Iris and enjoy the ending: you’ve completed the game! PilotWings: Resort – Flying High, or Crash Landing?